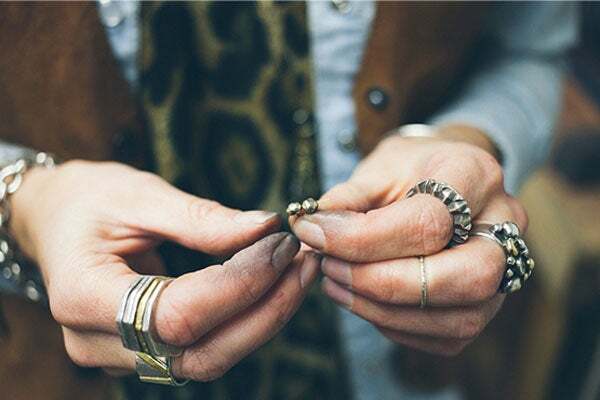 We’re longtime adorers of Oakland-based jewelry ace and aficionado Kate Ellen of Kate Ellen Metals, but her latest venture takes our awe to the next level. Her newest series, called A Rarity, focuses on an all-star roster of both local and New York-based designers who will create unique bits and bops each month to be sold exclusively at another one of our obsessions: local bauble boutique Crown Nine. Call us crazy, but having a dynamo design maven personally pick some of her peers to create one-of-a-kind pieces for our accessory-fiend pleasure, well, we are mighty intrigued, to say the least! The fun doesn’t stop there, because Ellen has teamed up with local photographer Eva Kolenko to delve into her fellow designers' studios, offering an insider’s glimpse into their creative spaces and inspirations. Each month, beginning this Monday, March 25, we can look forward to one or two artists, from the likes of Sarah Swell and Collette Ishiyama, and their chosen designs — which are all under $150 — to be featured on Crown Nine’s online shop. If shopping a selection of handcrafted, limited-edition gems and getting a look inside the makers’ process each month doesn’t sound like your thing, well, better stick to the cheese of the month club. But, for the rest of us, A Rarity has us charmed already!